Cool claps, snazzy snares, bopping bass and hissy hats… what’s not to love? • Every kit piece can be adjusted for pan and level, and have its Accent altered for a more nuanced feel • Velocity Retrofit for humanised beats! The Boss Dr Rhythm DR-110 followed on from their very successful DR-55 (which of course you can get hold of right here). 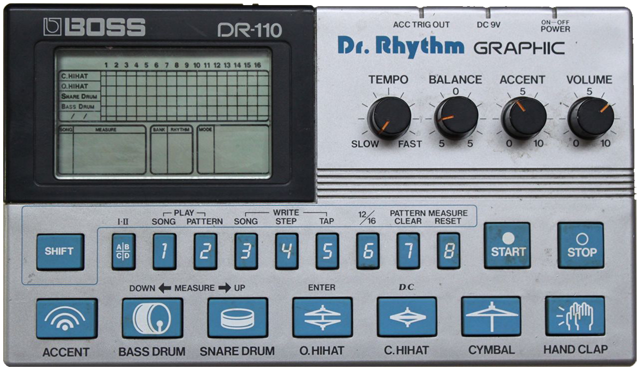 The DR-110 was another neat little analogue box, but whereas the 55 had involved a rather inscrutable interface, the 110 sported a very cutting-edge LCD panel so that you could grid-edit your beats graphically. This was a huge plus that hadn’t really been seen outside of high-end products before this point. Kudos to Boss! There are six onboard sounds plus a very useful Accent control for adding some variation. The kick is tight and controlled, the snare has a good high-frequency sizzle to it, and the hats are pleasantly metallic. The Cymbal sound is a bit strange, closer to a ride “ping” than a crash, but it works very well interspersed in a hi-hat pattern, giving some nice high-end lift. It also varies quite widely with use of the Accent control. We’ve sampled the kit pieces through the entire travel of the Accent control so that you can add the authentic sound of the Accent to taste – either using the front-panel controls on the interface, or via velocity using our Velocity Retrofit. This little machine really springs to life when played with velocity, and the tightness of the kit pieces combined with Accent variation makes for some great fast-paced funk beats. 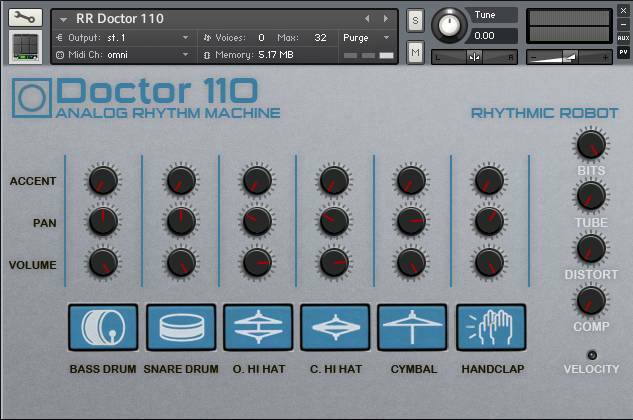 The Doctor 110 really has the edge when it comes to rapid-fire drum machine grooves with a humanised quality to them! The effects block includes all the tools you need to warm your beats up, glue them together, or mangle them into grunged-out nightmares if you want to. Compression locks everything in, while Tube saturation and full-on Distortion bring edge and grain to the sound. Bit reduction can turn down the quality all the way to lo-fi if you want to give those metallic hats a really savage attitude! The futuristic silver-and-blue livery looks a bit like something out of Blake’s Seven, but in many ways the DR-110 has stood the test of time a bit better than Avon, Servalan and the crew of the Liberator. The combination of analogue punch and surprisingly tight kit pieces makes this a very powerful addition to high energy tracks, while the range of variation offered by the Accent control can take it straight from drum-machine rigidity to natural-sounding flow. We can’t offer you the little padded gig-bag the original came with, but everything else – and then some – is crammed into this little Kontakt package! Doctor 110: give your tracks 110%! I was pretty excited for this one, and I like the sounds, but I can’t seem to find anything but the kick and snare on the keybed. I can hit them on the panel, sure, but I need more access than that at my novice level of sampler experience I guess. Another anomaly is that while I very much appreciate the Velocity mod, I can’t quite sense as much of a different between different Velocity strikes as I can on say my beloved RR MR11. A fun box, but it feels it is a few steps away from truly awesome. I wish in a way you could sort RR instruments by release date, as I suspect the sophistication of their instrument realization (as in rendering the fullness of an instrument’s potential in the form of a Kontakt instrument) has perhaps grown with them. I would love to compare instruments from different phases for features, present and missing. Or maybe they will someday sweep back through, adding glitch and velocity (complete with subtle gradations) to any instruments that lack these. I bought a DR 110 back in ’85 and my band played loads of gigs with it until we managed to persuade a human to join. I’ve been able to recreate all the original preset rhythms plus the ones we created. It really sounds like the original hardware. The interface is also super authentic. A must have for anyone who had the original drum machine. Another fine and beautifully priced recreation. I just can’t quite find myself using it as much as the 505 or Dr55, but pretty cool. Minimalistic to the hilt, but an accurate replicant nonetheless!